Amazon's latest Kindle is thinner, lighter and comes with cover that doubles as a second battery, but the price is a steep $290. The wedge-shaped Kindle Oasis is a petite and pocketable new e-reader from Amazon that sacrifices a bit of battery life to fit in the palm of your hand. Announced Wednesday, the Oasis is both shorter and thinner than 2014's Kindle Voyage, which means there's less space for a battery. It gets more than two weeks of battery life on its own, a sharp decrease from the Voyage, which claimed six weeks of life. To make up for that decrease, the Oasis includes a neat new accessory: a leather cover that doubles as a power source, extending the battery life for more than nine weeks. It also comes with a new, larger price tag of $290. The Kindle Oasis is the most significant Kindle redesign in four generations. Even though the E Ink touchscreen is the exact same size and resolution as the previous version, the 4.6-ounce device looks and feels significantly smaller. The new shape tapers off to an impressively thin 3.4 mm on one side. The other edge is thicker for gripping, evoking a traditional book spine. The two buttons next to the screen let you flip pages one handed. An accelerometer lets the reader turn the device upside-down and automatically switches the button functions. The contrast ratio is the same, and you can still flip pages by swiping the touchscreen. There is no warm night mode and the device isn't waterproof, but it still fits nicely in a Ziplock bag. Amazon (AMZN) didn't alter the Kindle lightly. The company is obsessed with studying how people read. It does field research, following readers around on their commute or to a cafe to see how they consume books in the wild (with permission, they're not just being creepy). At the company's R&D office in Silicon Valley, it has a reading lab filled with various lighting and seating options. Readers are invited to settle in with a book while Amazon employees take notes about reading positions and how they hold devices. With all that research, Amazon must have known the battery is the Kindle's most beloved feature. Kindles measure battery life in weeks and Amazon is being literal, unlike smartphones that last a "day" (that's code for 12 hours). The decrease in battery life from six to two weeks might be a turn-off to readers who dislike the stuffy look of the new covers. Available in black, merlot and walnut, the leather accessories attach with magnets and automatically recharge the Kindle. The Kindle's job has always been straightforward: to look as much like paper as possible, and let people read with minimal distractions. Amazon nailed that mission a while back. Subsequent devices have been so well made and loved, that there's not usually a big rush to upgrade, as with smartphones. That's good news for anyone who can't afford an Oasis. 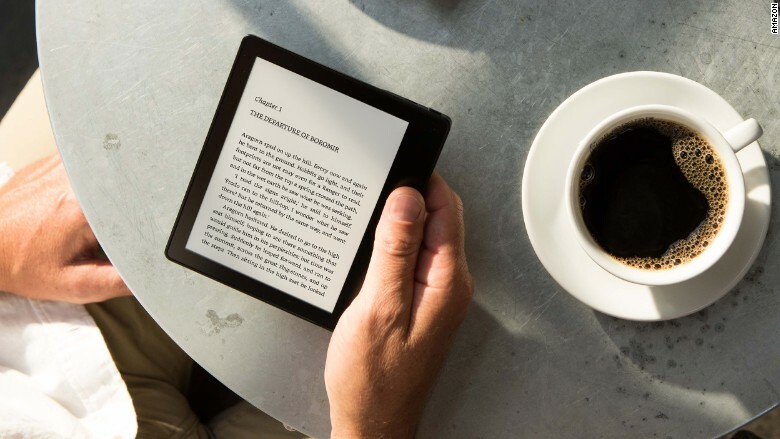 Ranging from $290 for a Wi-Fi-only Kindle with ads to $380 for a 3G ad-free Kindle, the Oasis is the most expensive Kindle since the first edition released eight years ago. That cream, button-covered eyesore cost $399. Amazon has long said it doesn't make money off the e-readers themselves. They're just a tool to get people to buy the 4.4 million e-books on the site. Content is the company's real money maker. The Oasis is available for pre-order online starting Wednesday and will start shipping on April 27. Chat with us in Messenger. Find out what's happening in the world as it unfolds.